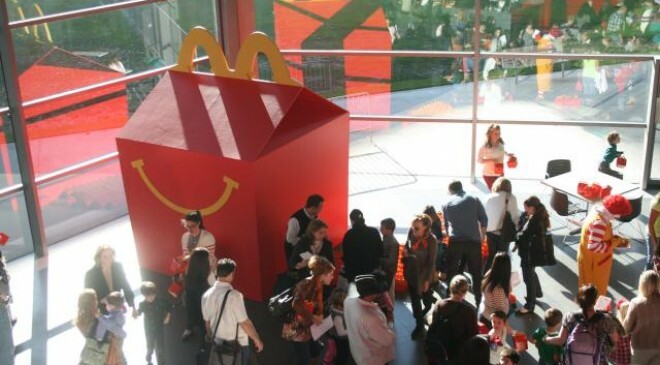 Young visitors to the AT&T Performing Arts Center were greeted by Ronald McDonald and the largest Happy Meal box in Texas! Ronald McDonald visited the Margot and Bill Winspear Opera House to take photos, sign autographs and celebrate McHappy Day, a fundraiser benefitting the Ronald McDonald House Charities of North Texas. Families visited the Center to see Clifford the Big Red Dog Live, and were surprised to receive Happy Meal boxes filled with a toy, a voucher for a free Happy Meal and information about the McHappy Day program. During November, McDonalds donates a portion of proceeds from each Happy Meal to Ronald McDonald House Charities in support of its mission for childrens well-being.